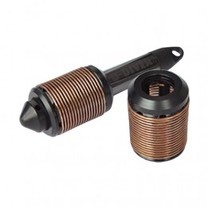 Where there is a need to monitor groundwater levels and salt water intrusion , injected wastewater, or contamination from chemical discharges and landfill sites, the CTD-Diver® with its 22 mm diameter rugged, corrosion proof ceramic (zirconium-oxide) housing, is the instrument of choice. The CTD-Diver is a submersible datalogger for long-term uninterrupted, real-time water level monitoring using a pressure sensor when submerged at a fixed level under the water surface. The pressure sensor measures the equivalent hydrostatic pressure of the water above the sensor diaphragm to calculate the total water depth. In addition, to a pressure sensor the CTD-Diver is also equipped with a 4-electrode conductivity sensor for measuring the true or specific electrical conductivity of the water. The Diver autonomously measures conductivity, pressure and temperature and records them in its internal memory. The Diver is ideal for ground and surface water level applications. The CTD-Diver is equipped with a four-electrode conductivity sensor that measures electrical conductivity from 0 to 120 mS/cm. There are two options for measuring conductivity: true or specific conductivity at 25 °C. 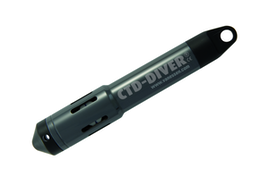 The CTD-Diver can store 48,000 measurements (date/time, pressure, temperature and conductivity). The CTD-Diver has the following sample methods: fixed length intervals, event dependent, averaging and pumping test. The CTD-Diver is available in the following pressure ranges: 10 m, 50 m and 100 m.
Diver-Office is an easy to use application to program Diver dataloggers and download measurements onto your PC, export the data to a spreadsheet or modeling program. Diver-Office is a flexible “project-based” measurement software package designed for exchanging Diver data. Diver-Office is easy-to-use and has an intuitive user interface. The USB Reading Unit is connected to a USB port of a PC, laptop and/or tablet. Simply insert the Diver into the base of the USB Reading Unit to connect to it using the free Diver-Office software. Once connected the Diver can be programmed, settings or data read. 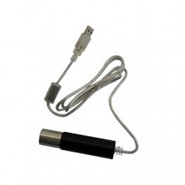 The conductivity sensor of the CTD-Diver can be calibrated using the USB Reading Unit. 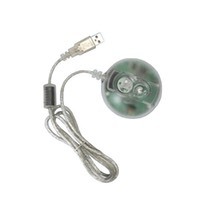 The USB Reading Unit can be used in the field or the office and supports all Divers. Note: Diver-Office must be installed to be able to communicate with the Diver. The Diver Copper Shield protects the CTD-Diver from bio-fouling and reduces maintenance cost. There are many methods that can be used to prevent and remove the bioaccumulations. However, these methods can be expensive and detrimental to the environment. There is a lesser known natural solution that is a good match for the CTD-Diver and is effective at reducing the development of microorganisms. The Diver Copper Shield is a copper coil shield specifically designed to significantly reduce the growth of algae on the electrodes. Thus reducing the need for maintenance and reducing the time spent on site. Bio-fouling is the undesirable accumulation of microorganisms, plants, algae, or animals on wetted structures. This is especially prominent in surface water monitoring in warm environments. Bio-fouling causes an algal growth on the electrodes of the CTD-Diver. This may affect the conductivity readings and increases the need for maintenance. Removing the biological materials from the electrodes can be damaging over a prolonged period of time and increase time spent in the field. Deploying a Diver on a Diver communication cable saves time on downloading and provides real time data from a Diver. Connect your laptop equipped with Diver-Office to the Diver Data Cable using the USB Interface Cable to program and read data from the Diver. Available in lengths from 1 meter to 300 meter. The Diver-Mate can be connected directly at the top connector of this cable. The Diver Smart Interface Cable™ is a communication device to link the Divers deployed on a communication cable (DXT or DDC) to a PC, laptop and/or tablet. Simply plug the Smart Interface Cable in an available USB port of the computer and connect the other end to the communication cable. The deployed Diver can now be accessed using the free Diver-Office software. Once connected, the Diver can be programmed, settings read, or data downloaded. The Smart Interface Cable features a barometric sensor that allows for real-time comparison of Diver readings and manual measurements. After connecting the Smart Interface Cable, the Diver can be returned to its original position in the well with the supplied Suspension Plate. The Smart Interface Cable features indicators for sensing if a cable is connected, a Diver is connected to the communication cable or if the communication cable is malfunctioning. The Smart Interface Cable can be used for communication cables from 1 meter up to 500 meters in length. 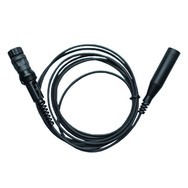 The Smart Interface Cable is designed to be used in the field and supports all Divers. Note: Diver-Office 2017.2 or later must be installed to be able to communicate to the Diver through the Diver Smart Interface Cable. The Diver-Mate is designed for simple and fast download of data, increasing download efficiency while reducing data transfer errors. 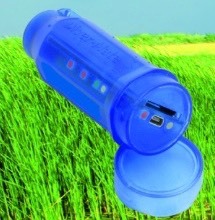 The Diver-Mate can store Diver data from hundreds of Divers. Used in combination with a Diver communication cable, this downloading unit stores data in a non-volatile memory drive, meaning that even if the battery is empty the data will still be available. A full battery can support more than 10 days of operational use and a LED will indicate when the battery voltage is low. The Diver-SDI integrates Divers with SDI-12 remote monitoring systems. A typical SDI-12 system is depicted in the figure below. 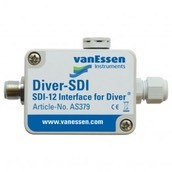 On one end the Diver-SDI is connected to the SDI-12 system through the 3-wire SDI-12 bus which also include the power supply of 12 Volt. On the other end a Diver cable (AS2xxx) is attached to connect the Diver-SDI to a Diver. Diver cables up to a length of 500 meter (1,640 ft) can be used with the Diver-SDI.